Big Walnut senior Emily Neff (center) tries to split the defense in the Golden Eagles’ scrimmage at Olentangy Berlin earlier this month. If nothing else, the Big Walnut girls basketball team will be battle-tested with six players that played on the soccer team’s state final four team. And the Golden Eagles basketball squad had to adapt fast. 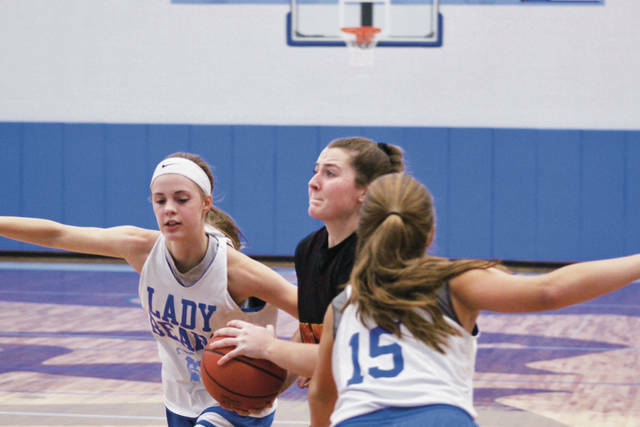 The girls soccer team finished its season Nov. 6 and the first basketball scrimmage was a week later. The Eagles are coming off a pretty strong campaign in their own right in Crawford’s first season. They finished 17-7 and 6-4 in a very strong OCC-Capital on their way to a Division I district semifinal before being eliminated by Reynoldsburg. BW is Division II this year and, while Crawford won’t admit that the road is easier, it’s certainly not as daunting. “Obviously, our goal was to get (to the district final) last year and that’ll be our goal this year no matter what division we’re playing in,” Crawford said. Senior Erin Boehm is the team’s top returner, averaging 10.3 points, 5.0 rebounds, 3.7 assists and 3.0 steals per game while running the point last year. One key loss is junior post Abby Facemyer, who will miss the season with a torn ACL. Neff, the team’s only other senior, can relate to what Facemyer is going through. She suffered the same injury at the end of her sophomore season. Crawford expects a committee of Neff and juniors Brook Stooksbury and Payton Carter to help fill the void in the post. Neff pointed to Stooksbury as someone who held the team together in the offseason – particularly this fall when so many were playing soccer. Juniors Avery Schone and Alexis Schone return as guards with fellow junior Alyssa Tarney helping out as a guard and a forward. Sophomores Abby Brown and Avery Maxeiner are a pair of newcomers on the varsity level and will provide depth at the guard positions.